Would you like your widget to display on all pages in your domain except for some? 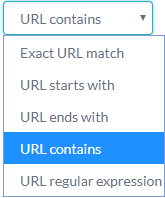 In Targeting you can select on which URLs you want to show the widget, either through defining the criteria for enabling or disbaling the widget. What&apos;s more, you can add more than one rule for one targeting group! If you require assistance setting up the targeting group, feel free to message us on the chat or at hello@livecall.io.